This is the personal flag of Stanley M. Max, a member of the U.S. Metric Association. On the flag’s field, the circle circumscribing the cross is the astronomical symbol of the Earth, and the curved arrow demarcates one-quarter of the planet’s circumference. 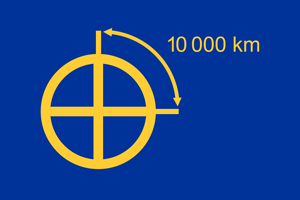 The French revolutionary government, upon establishing the metric system in the 1790s, commissioned a study of the length of the meridian passing from Dunkirk to Barcelona, and decreed that one ten-millionth of the arc extending from the North Pole to the Equator along this meridian would constitute a meter. Hence, a quarter circumference of the globe measures ten million meters, or 10 000 kilometers. 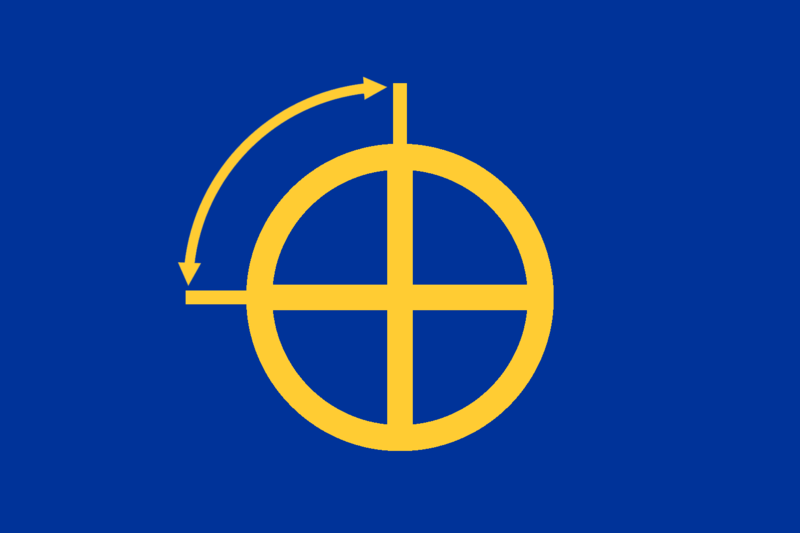 The ratio of my flag is 3:2, which is the same proportion as the flag of the European Union (EU). A major proponent of the metric system, nearly every EU member country exclusively utilizes the metric system for its system of weights and measures. The flag features two colors. One of them is Pantone yellow (RGB: 255/204/0), used for the stars on the EU flag, and the other is Pantone reflex blue (RGB: 0/51/153), used on the field of the EU flag. At least approximately, these same two colors also figure in the logo of the Bureau International des Poids et Mesures, the international agency headquartered near Paris whose charge is to administer the International System of Units (SI), as the modern metric system is known.